After months of hype and delays Apple finally released the iPad in the uk. For me it was a release filled with trepidation and uncertainty. As a card carrying Apple fanboi, I had to buy one, but it wasn’t something I was lusting after. There were many things about the iPad that excited me, but even more that made me worried. Some of these concerns stem from the way early adopters, and Apple’s marketing team, have described the iPad. There’s been a dearth of tangible benefits in the reviews, which is worrying. Rather, we’ve had words like “magical” used in the marketing materials and many reviewers talking of holding the Internet in their hands and other equally intangible, subjective descriptions. However, after spending nearly two days with the iPad, and barely putting it down, I can see where they’re coming from. We can, and probably will, debate the technical merits of this device over the coming months, but that doesn’t go any way to touching on the level of enjoyment you get from this device. It really is like nothing else out there. If you’ve picked up a Windows or Archos tablet over the years, and you think the iPad is cut from the same mould, you couldn’t be more wrong. It is the antithesis to a Windows tablet, and it’s the sort of device the Archos engineers dream of in their sleep. Something that you may not fully grasp about the iPad is that it’s the most social computing experience you could ever wish to have. When I’m using my MacBook, I’m usually lazing on the sofa next to my partner who’s watching something on TV – it’s quite an anti-social experience. The MacBook’s screen forms a wall between us, and the humming of the fans can be distracting (it’s far more than a distraction if I dare watch a movie in Flash, it’s downright disturbing) to the other person. It’s also a bit of an ordeal to show another person what’s on the screen, usually involving some sort of balancing and/or juggling. The iPad is different. It’s silent. Completely and utterly silent. Even swiping, tapping, typing produces nothing but a faint muffled sound which wouldn’t disturb a sleeping dormouse. Many computers claim to be silent, or quiet, but this is the only one I’ve come across that actually achieves true silence. And it’s golden. Another way in which the iPad differs from a laptop is in the mechanics of physically interacting with it. If you’re using a laptop, the form factor dictates a relatively flat surface on which to rest the hardware. No such restriction exists with the iPad, it’s more akin to reading a book or magazine. The wall has been demolished, and sharing content with another person is about as simple as it can get. 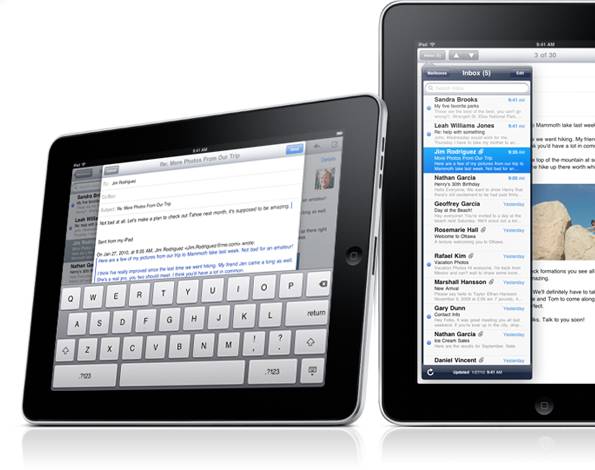 Flip the iPad over and the screen automatically rotates to the appropriate orientation for them. The IPS screen does a wonderful job of allowing wide viewing angles, making the entire process much easier and less haphazard. This is social computing not in the FaceBook or Twitter sense, but rather in the more tangible person with you in the room sense. I said above that the iPad is the antithesis to a Windows tablet, and it is, at least in terms of execution. The iPad is once again a closed system. You have to buy apps from the app store and you have to activate it through iTunes. This approach doesn’t seem to bother people with Blu Ray players or games consoles, but it really seems to bother people when it comes to Apple devices. It doesn’t bother me, and I attribute the stability of my iPhone at least in part to this approach. Either way, people should know by now what they are getting in to. The more of the eco system you buy in to, the greater the benefit. When it comes to functionality, Apple have taken a very deliberate iterative approach to their mobile products. Each version does a little more than the last, but they make sure that everything it does do, it does well. Contrast this to a Windows Tablet that will do anything you want, badly. I remember the good old days of Windows Tablets where a massive memory leak ensured that you couldn’t use the tablet for any length of time without is crashing. This bug persisted for years. The applications on Windows tablets are also just normal Windows Applications. There’s very little incentive to adapt applications to work with a touch screen, making them awkward to use. 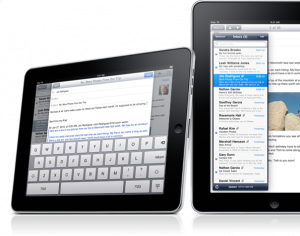 The iPad is fundamentally different. Every app is optimised for at the minimum a touch screen, and many are optimised for the very screen your using. The iPad doesn’t do everything, in fact there’s a lot that it doesn’t do. But rest assured, everything it does do, it does well. It’s clear that Apple are rolling with the book metaphor with the iPad. The marketing videos show people enjoying the iPad in positions you might usually find them enjoying a book, The case opens like a book, and stands like a book. The iBooks App is heavy with book metaphors, like the book case and the page turn effect. But the book metaphor doesn’t stop there. Looking through some of the core apps it’s clear that Apple were using a consistent design language throughout the apps. The address book, for the first time, actually looks like a physical address book. Likewise the notes app. And the calendar app looks like a beautiful planner. It’s all there, and in other devices it may come across as tacky, but the consistency really allows Apple to pull it off. An interesting debate was raging around the time of the US iPad launch as to whether it’s a capable content creation device or whether it’s purely for consuming content. Well first, it has to be said that the iPad is a spectacular content consumption device. Possibly the best I’ve ever used. Browsing the internet is a step above any other internet browsing device I’ve tried, even with the gaping hole that Flash leaves. It’s so fast and so responsive that the simple action of scrolling around pages and following links is enjoyable. The iPad also scores highly when it comes to rendering content, typography is crisp and sharp and readable, images vibrant and if video is encoded correctly it can look great. But what about as a content creation device? Well sorry to be a little coy, but it depends on the type of content being created. Apps like Brushes allow a great freedom to create artwork that would require specialist equipment with a regular computer (namely a tablet). It’s fluid, and easy to use and fairly comprehensive. For text creation, it can be hit and miss. If you’ve got the optional wireless keyboard, or the keyboard dock, it’s a joy. You do have to change your habits somewhat so that you aren’t constantly reaching for a mouse, but you get over that quickly. Without a hardware keyboard, it’s more difficult. The soft keyboard is one of the best, but has the same problems as any soft keyboard. A particular problem I had was accidental key presses. There are types of content you simply can’t create on an iPad. Video editors for example are left mostly out in the dark, although I’m sure there are video editing apps on the way. Likewise if you’re a developer of any kind, there are no usable iPad IDEs, although that’s no surprise. Music editors and creators are fairly well catered for though. The big surprise for me was not the quality of the video but rather the quality of the audio. It’s very very good for integrated audio on a device this size. It feels as if Apple are using the case to reverberate the audio internally to give it a bit of depth. Video is very nice, although the strange ratio of the screen does take something away. Widescreen is to too wide, and if you zoom in it’s a bit too close, leaving you with an unmistakeable feeling that you’re missing something just out of screen. The iPad app is also a little strange, for lack of a better word. There’s nothing wrong with it per se, but it feels like a missed opportunity. There’s enough screen space to do something spectacular, but the current interface feels a little workmanlike. The iPod Touch’s Videos / iPod split is back, which will be a new experience for iPhone users. I want to get down a few thoughts on the hardware itself. The iPad itself is heavier than you might expect, but not uncomfortably so (YMMV). It also feels incredibly well put together. All the seems and joins are tight, there’s no flex at all, which is unusual given the huge screen and back, and all the physical buttons, all four of them, move in a satisfying way. In my two days of ownership the iPad has never become warmer than the room it’s in and battery life has been nigh on unbelievable. I’m writing this on the iPad, using a bluetooth keyboard, so bluetooth is on. WiFi and 3G are also both on and the screen brightness is on auto. I’ve been using the iPad pretty much constantly since 10AM this morning (it’s now gone midnight) for web browsing, video watching app using and even using Google Maps over 3G while out an about. The battery is currently sitting at 34%. There are some things you can do to drain the battery faster though. For example, I played the scrabble app last night using two iPhones as the tile racks. This caused a bit of a hit on battery life, but even so (and bear in mind it meant establishing a constant bluetooth connection with 2 devices and running a game) you shouldn’t worry about getting through a game. Going back to the screen ration briefly. Whilst it not perfect for video, it’s not far off perfect for reading books and websites. It’s also pretty close for photos. The size of the device also feels right for the sort of tasks you’ll be using it for. The best summary I can give, and the best endorsement is this. Since the iPad came out I’ve spoken to two people who were absolutely adamant before the launch that they wouldn’t buy one. One of these people is actually fairly anti-Apple. After trying the iPad, they’ve both gone out and bought one, and theta both love it. It’s that sort of device. Apple has been using emotional language to describe it because it’s an emotional device. There are few logical and technical reasons to buy an iPad; you’ll buy one because when you try one you’ll feel an attraction to it. So have you picked one up yet? Have you tried one? What did you think? Note: I’ve been using a 32GB 3G iPad and this post, in its entirety was written on it using the free WordPress app.